Looking at the string of words "Hiram Green Hyde" — green hide stood out. 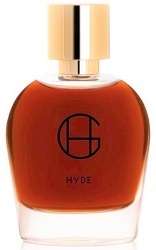 (Hyde is a unisex leather perfume described as "challenging" by Hiram Green.) Certainly, any perfume with green hide as an inspiration would be a challenge to wear; green hide is the skin right off a newly killed animal, with flesh, blood, hair and fat still clinging to it. I've read about green hides while studying indigenous art and leather-tanning techniques of American Indians. I'm happy to say there's no smell of green hide in Hyde, but it does bring to mind (and nose) scents of Mexico, and another indigenous group: the Aztecs. Hyde's short-lived opening isn't citrus-y, but reminds me of BAND-AID® bandages. After a minute of "medicine" comes the soul of Hyde: the aroma of fresh maize (corn) dough being prepared to make tortillas. Within the eccentric heart of Hyde, I smell maize, the hot comal (skillet), smoke, and puffing, blistering tortillas. The scent of homemade corn tortillas is a favorite of mine: it's scrumptious and elemental (Aztec culture came to mind since I love to look at old codices). On some days of wear, I detect an accord that reminds me of gingerbread batter, heavy on the molasses. Hyde is a gourmand fragrance of a different order — a 'food-y' leather. It takes a long while for the next phase of Hyde to develop; during it, I smell dense, "grimy" birch tar, labdanum as black as coal, and some prehistoric version of "vanilla." Cassie flower and citrus? You've got to be kidding! No way could they compete with Hyde's dark, powerhouse ingredients (though they may contribute to the strange fragrance accords of Hyde). Hyde's base is where I (finally) notice "leather," and it's a bawdy, musky, waxy hide. Since Hyde has astonishing tenacity (one spritz is sufficient), a 5 ml bottle would be just right for me. 50 ml?...that would be like having 100 boxes of chocolate-covered cherries sitting in my cupboard. Hiram Green Hyde Eau de Parfum is $165 for 50 ml. The listed fragrance notes include bergamot, lemon, cassie flower, birch tar, labdanum, vanilla and oakmoss. 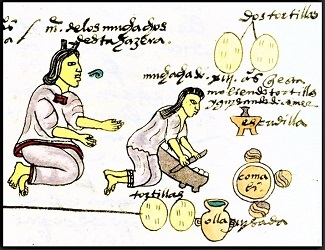 Note: top image is Detail of the Codex Mendoza's folio 60r [altered] and shows a mother teaching her daughter to make tortillas; via Wikimedia Commons. I can’t decide if I think this is a weird perfume or interesting…interestingly weird? I would be fun to try it out but I doubt the company is no where near to find in Denmark..
Littlecooling…headquartered in the Netherlands, so not too far…. You can order small samples directly from Hiram Greenes site. I’m in Sweden and have been ordering samples from him many times without any hassle. I wanted to like this but it smelled like bbq smoke on me. I absolutely adore Hyde! Right after Arbole Arbole it’s my 2nd favorite from Hiram. Shame he gave up on selling those 10 ml travel sprays. L, I would wear all HGs except Arbole…and that one has tons of fans it seems. Arbole smells awful to/on me. I like or love all the rest. Thanks as always for the review! I love Hyde, it’s on top of my To buy next-list. All that sweet smoke and leather is wonderful to me. I found Arbole arbole much more challenging – I can’t decide what to think about it. I find the drydown on Arbole pleasant, but the opening is difficult. Sorry to hear the travel sprays are discontinued.